…then why do they have all those judges in the first place? 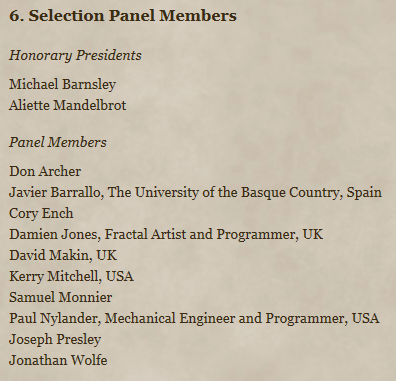 Apparently the Honorary Presidents aren’t “judges” and yet they are considered to be Selection Panel Members? But they “did express their own choices”. How? To whom? I would expect the Honorary Presidents to be judges. Isn’t that what the above screenshot from the Rules suggests? My point is: if they’re going to do so much adjusting of the judging then why bother having 12 people vote. Wouldn’t that just create a great deal of noise rather than clear results? Wouldn’t it simply create the need for one person or a few senior people to step in and break ties and chose which image by a popular artist becomes their only winning one? Dave Makin, (a judge) in a recent comment here has shed some light on the judging process and for that I really am grateful. But I question just how much any one judge really knows about the actual selection since there’s so many of them and the expressed need to show “diversity of fractal styles” and a whole bunch of other rather subjective things stated in the official rules makes it a task that necessitates some strong oversight and direction. Personally, I think that big list of judges is nothing more than a smokescreen to justify a whole lot of “adjusting” to go on. Call it a “discussion” but it defeats the entire purpose of having 12 people judge if the results aren’t going to be honored and a whole lot of negotiating is to go on afterwards. It creates a situation where each judge really has very little say in the final outcome and their votes cancel each other out. And where the final results can be claimed to be a group decision when in fact no group that sizes is capable of coming to any clear decision on 25 pieces of art. You end up with an exhibition that no one voted for. From that sort of “judging” comes the sort of “winners” we’ve seen this year. You are obviously much more talented than me, I could not compete!